Last week, CT and I were somewhat shocked to find we’d been together for twenty years. How did that happen? To celebrate we both took the day off and went clambering around the Cornish coast. We also called in at the Canteen at Maker Heights. How could we resist the best food in those parts? There, sitting on the counter was a round of almond rye shortbread. Completely intrigued, I had to recreate it. The Canteen up on the hill at Maker Heights is a recent discovery for us. We’ve both been incredibly impressed. It’s not a vegetarian establishment, but it offers some of the best vegetarian cuisine I’ve ever tasted. The menu is imaginative and the flavours are complex. Unusually, it’s based in a couple of old army Nissen huts and has stunning views out over Cawsand Bay. We arrived in time to take advantage of the breakfast menu. CT went for a full English and I had possibly the best veggie breakfast I’ve ever eaten, with roasted shallots, leek tempera and hispi cabbage to accompany the more usual eggs, beans, mushrooms, tomatoes and toast. Less usually, the eggs were poached and the toast was sourdough. I often grind my own almonds when baking. This gives a fresher and tastier result with a more interesting texture. This almond and cardamom rye shortbread was one of those occasions. I went with a mix of half rye flour to half ground almonds and used the classic shortbread measures of three sixths flour, two sixths butter and one sixth sugar. Cardamom seemed like the right thing to add somehow and I was absolutely right. Annoyingly I left it in the oven too long, so it was a little darker than I’d have liked. I’ve adjusted the baking time in the recipe so that this doesn’t happen to you. Despite being a little overdone, the almond rye shortbread was totally scrumptious, being buttery and crumbly, but also slightly chewy. The variations in the size of the nut pieces made for a great texture and the cardamom flavour was noticeable, but only just. It went beautifully with some Cornish raspberries, half of which I used to make an accompanying whisky raspberry cream. Crumbly, chewy shortbread with a robust but delicious flavour. 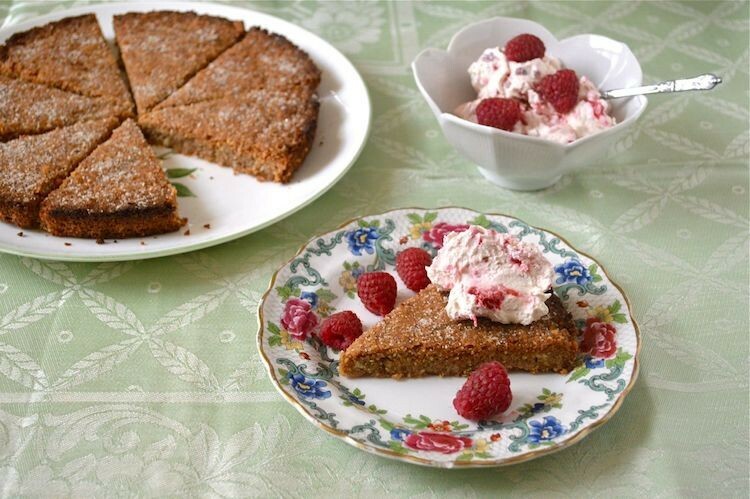 Serve it with tart raspberry cream with whisky for a wicked complement. Place all the dry ingredients in a large bowl (putting 1 tsp of the sugar to one side). Cut in the butter, then rub it in between fingers until most of the buttery lumps have disappeared. Bring the mixture together into a ball and then press into an 20 cm (8") greased tin. Bake in the centre of the oven at 180℃ for 20 minutes. Cut into 8 triangles, then sprinkle the tsp of sugar over the top. Whisk the double cream and whisky until just holding its shape. Roughly mash in the raspberries, saving a few for decoration. Serve on top or beside the shortbread. You can use bought ground almonds, but you'll get a tastier and more interesting shortbread if you grind your own. This makes 8 large pieces, so it could easily be cut into 10 or even 12 pieces for something a little more modest. This goes to Jac over at Tinned Tomatoes for Meat Free Mondays. Almond Rye Shortbread. PIN IT. Awesome! 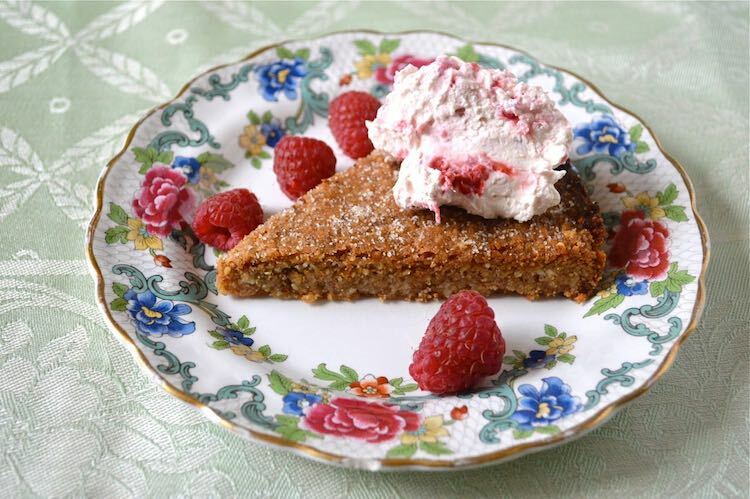 I love that you made this with wholegrain rye and that raspberry whipped cream makes it even more special. Excellent, Choclette. Thanks Kerry. I’ve only ever tried bakes made with rye flour if they’ve been made by me, so I got very excited when I saw this. Who’s Lucy BTW? Congratulations! Yes, GL and I were shocked to discover that we too have been together for 20 years, can’t quite believe it… Glad you were able to celebrate, sounds like a lovely day and the shortbread looks delicious! Congratulations to you too Katharine. Where does the time go? Congratulations on 20 years – that is very impressive. This shortbread looks like a great way to celebrate and it’s always a pleasure to stumble across unexpectedly good vegetarian food. Thanks Kari, it all feels a bit unreal. How did we get this old? Shortbread helps. ahhh congratulations… but whiskey raspberry cream… um HELLO!!!!!!! I don’t know where to start with this post – leek tempura with breakfast?! Heaven! And your shortbread looks amazing, and I’m drooling over the cream!! It really was a fabulous breakfast. Just as well for my purse that the Canteen is not on my doorstep. Shortbread is a firm favourite here, but it was good to try something a bit different. That shortbread looks amazing and the cream just takes it over the edge! I’ll have to look out for rye flour and give this a go. YUM! Thanks Helen. Rye flour works a lot better in bakes than you’d think. Do give it a try and let me know how you found it. Oh nice Choclette. I always love a slice of homemade shortbread. This is something I’d like to try. I have never tried to combine rye and almonds before and I’m curious about both taste and structure. 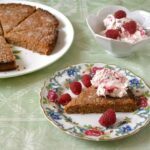 Not sure about the rye together with the raspberries, but who knows …..
Choclette, your shortbread looks utterly fabulous. Thick and brown and crumbly looking and it looks like it’s got some real texture. Really excited by this! Thanks poppy, the shortbread was a great success, even though I did overdo it a little bit. Thanks Johanna. It’s quite fun making well known recipes but giving them a bit of a twist. It’s probably just as well the Canteen isn’t closer, or it would be too tempting. I baked this shortbread yesterday. It has indeed a lovely taste and texture. Even on its own it is delicious. Very easy to make ! 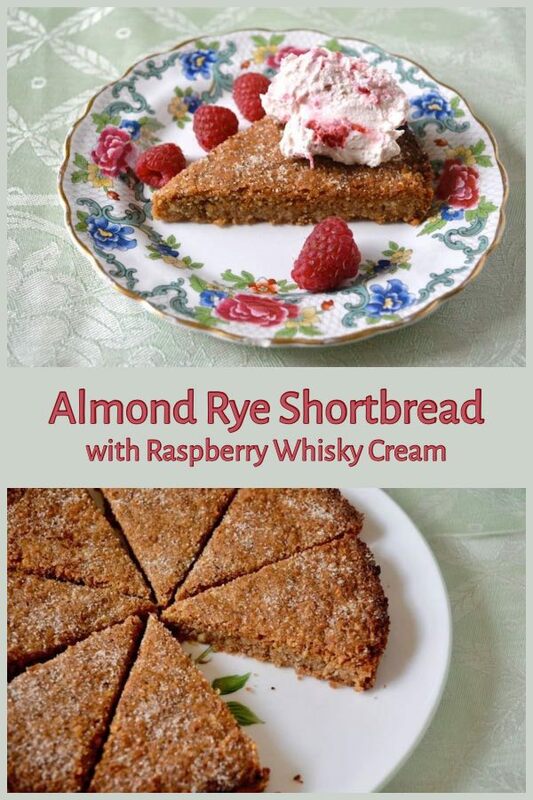 It is not always easy to use rye flour in sweet bakes I find, but this one is just right. Hooray Henk. Thanks for the feedback. But don’t tell me you made one of my recipes without making any changes at all? 20 years? Wow! Congratulations to both of you. That breakfast looks to die for! 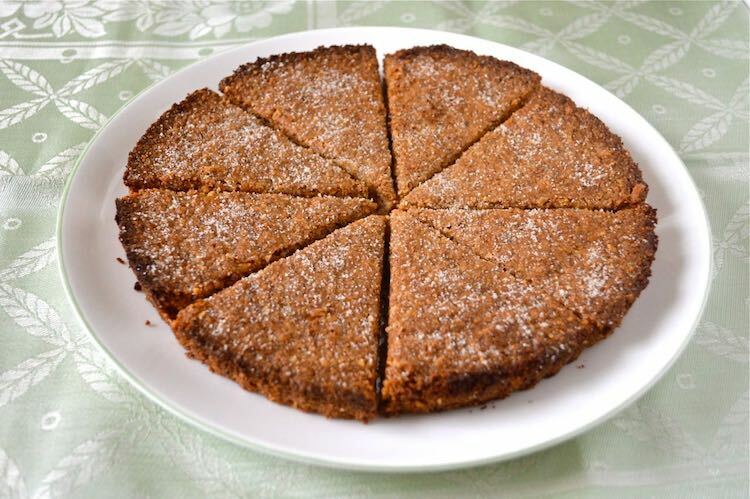 And the shortbread sounds darn good as well…. Mind you, I think I may have to eat a whole dish of the cream on its own!